Finally getting around to an update on my new(ish) 60L planted Juwel tank. This was an upgrade from my first tank - a 29L which housed a few endlers. Started a fresh with this one, unfortunately the one remaining endler didn’t last in the new tank. But on a more positive note things now seem to be looking better. I’m furiously touching wood! Currently stocked with 4x salt & pepper platies (2x female, 2x male) and 2x nerites. I’m fairly sure one of our female platies is pregnant - she’s got a pretty huge belly compared to the other females and has recently taken to hiding away from the others. Hard to tell if she’s got a gravid spot due to her colouring. Will be v interesting to see what happens. I’d quite like to add some amano shrimp in the next few weeks but I’ll see how things progress with the fish for a bit. And in the meantime here’s a pic - our cat is rather taken with the new set up as you can see! Looks nice Lottie You leaving the vallis at the back to grow up and along the top of the water? Reminds me of that very old add, "put a Tiger in your tank", lol. Looks stunning Lottie. (02-08-2018, 11:41 AM)wingnut55 Wrote: Reminds me of that very old add, "put a Tiger in your tank", lol. Looks stunning Lottie. Loving your tank Lottie. And the cat is grgeous. 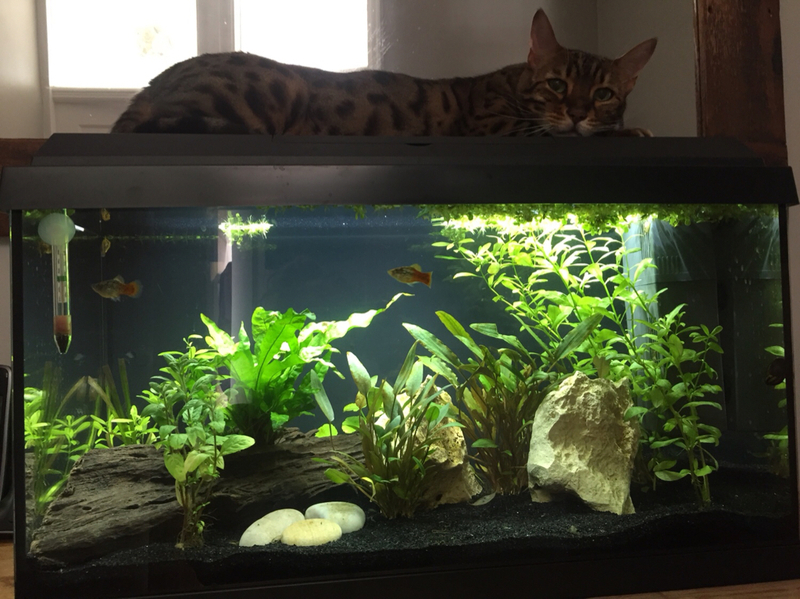 Beautiful tank (and cat!) Plants are looking great, I love the crypts. (02-08-2018, 08:26 AM)fr499y Wrote: Looks nice Lottie You leaving the vallis at the back to grow up and along the top of the water? Thank you. And yep, that's the plan. The plant pretty much melted away to nothing but has some new growth so I'm hopeful we'll get come good coverage. Thanks everyone for feedback. I'm pretty happy with the layout. Our cat, Matilda, is a 5 yr old Bengal. She's got a lot of personality but seems to find the tank relaxing so that's good. Bit of a sad discovery this evening when I got in from work. The female I thought was pregnant had died. Other than being shy and having a big belly there was nothing unusual. No signs of parasites to my (novice) eye, no fin clamp, no ich or anything. Is this just unlucky? I have it in my head that if the tank is properly set up and cycled and the fish look healthy when you buy them, really you shouldn't be losing any? Could the males have harassed her too much (I didn't see any signs of this)? Nitrite & ammonia tests negative. Little disheartened as I don't want a repeat of the endler tank nightmare. Is there an all-round medication I should dose the tank with in case there's something lurking? Sorry - lots of questions! Could the big belly have been internal parasites, eg. worms ? Otherwise it could just be one of those unexplained deaths - the most frustrating. That's what I'm a bit worried about after a bit of research this evening. I've found API's General Cure (https://www.amazon.co.uk/dp/B007R5M7V6/?..._lig_dp_it) which looks like it might be worth investing in. Any experience with this? Agree that these unexplained deaths are the worst - hate not having answers.